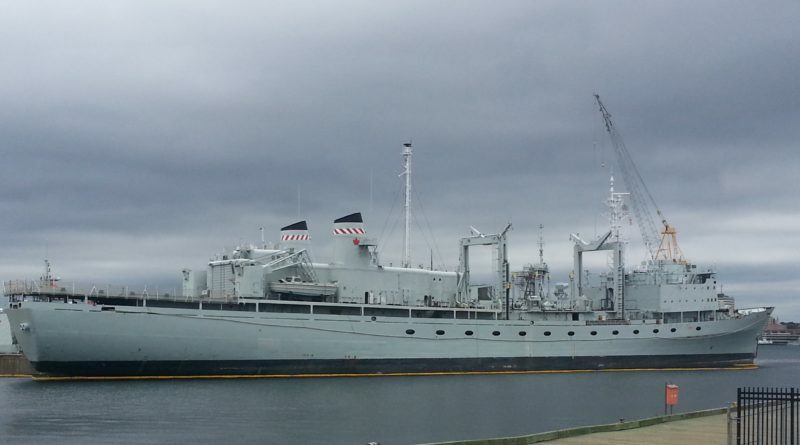 August 2, 2017, will mark the end of an era for the Canadian built Protecteur-class AOR (Auxiliary Oiler, Replenishment) when Preserver transfers from the Royal Canadian Navy (RCN) to her new owners, Marine Recyling Corporation. Navy tugs will tow the vessel one last time a short distance off of her berth at Her Majesty’s Canadian Dockyard Halifax, from where she will then be transferred to a civilian tug and towed to a special facility in Sydney, Cape Breton for breaking and recycling. As I toured the flats taking part in the last official tour of the vessel, I reflected on the bygone era represented by the ship and her predecessor, Protecteur. Standing on top of the bridge next to the Officer of the Watch’s station by the Engine Room speaking tube, I could envision the numerous ‘sundowners’ that area had witnessed. How many times had the Captain and his ship’s officers spent a few quiet contemplative minutes up in this spot? How peaceful it would have been on some far off ocean, sipping a beer and perhaps indulging with a cigar, quietly contemplating life at sea as the fiery orb sank once again into the abyss. As we traveled through the stripped out 555 foot long ship, I wondered how many Duty Roundsmen had followed these paths? How many thousands of times had the decks been scrubbed or the brass fittings polished? How many dignified cocktail gatherings, ‘channel fever’ parties, baptisms, summary trials, mess dinners, RPC (Request the Pleasure of your Company), and countless other functions were held in the Officers’ Wardroom, Chief & POs’ Mess, Hangar and the Main Cave? What were the number of sea ditties floating about the fleet generated from decades of good natured Preserver sailor’s high jinx? The old ship’s motto was ‘Heart of the Fleet’ but it was the continuous presence of thousands of RCN sailors serving, living and toiling aboard her over all those decades that brought life to inanimate steel. Their salty souls permeate the bulkheads and deck plates. But the old lady’s time has come, and she is scheduled meet her fate at the breaking yard. Back on July 30, 1970, when she was put into commission at the New Brunswick Saint John Shipbuilding yard, it was still common for ships to be powered by steam, and she ended up as the last boiler powered vessel in the RCN. In addition, many materials used in her construction are long gone from today’s modern ships. Miles of PCB coated copper wiring run through her hull. Much of her interior surface is covered with the old ubiquitous Navy red lead paint. Marine Recycling will have a challenge to safely removing all those toxic substances. 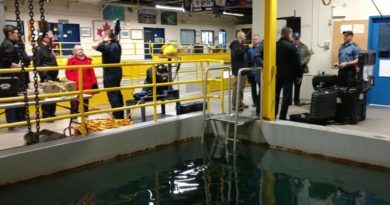 Helping to ensure their proper disposal, our RCN tour guide explained that the Department of National Defence will continue to play a watchdog role until the last fifteen feet of the ship is left. 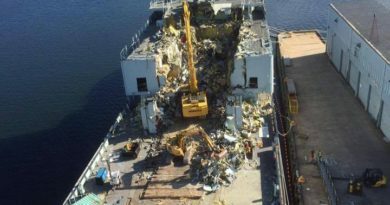 The building and ultimate breaking of Preserver represents a true ‘cradle to grave’ Canadian shipbuilding process. Preserver faithfully functioned as a vital force multiplier for the RCN. But as the world moved forward, parts for the old ship became scarce and tightening environmental regulations would have kept the single hulled fueling vessel out of most ports. But Preserver’s usefulness has not entirely waned as she will perform one last useful task for the Navy. The military always ends up in possession of material and equipment that has become obsolete or too expensive to dispose of. Much of this material ends up warehoused to collect dust. There is a unique item still onboard the ship that epitomizes this dilemma of how to dispose of items that have outlived their usefulness, namely the Wardroom piano. Years ago, an upright piano was presented to the ship’s officers as a gift. It is said to have taken four days of work pulling up hatches and making openings to bring it to its home onboard. The time and effort to remove this unique musical instrument is now not worth the bother. So as is common in the military recycling business, the new owners will receive a ship full of extra bits and pieces of military surplus including a piano. Wouldn’t that be a rare find a few months from now on EBay? There is always a touch of sadness and nostalgia when you say good-bye to a ship, especially when it is the last of her type. The countless eyes who have witnessed innumerable sunrises and sunsets from her decks and stared across the thousands of miles of endless oceans are long gone. All that is left is for the graceful old lady to take her final voyage into the setting sun. Blair Gilmore is a retired naval officer of the Canadian Armed Forces. Photo: Preserver alongside Her Majesty’s Canadian Dockyard Halifax, 28 July 2017, ready to be towed to the ship breaker. Photo credit, Blair Gilmore, RUSI(NS).